Spindle Cottage is located in the beautiful village of Binegar in Somerset. 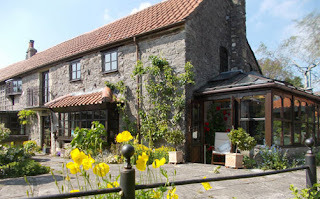 This fairytale holiday cottage dates back to the 17th Century and is a magical place for five people to escape to from the hustle and bustle of modern day living. Step inside the cottage and you find a world of make-believe, with carvings of mushrooms, spiders webs, birds and mice in oak beams and stone work. Guests can enjoy finding the many carvings throughout the house. 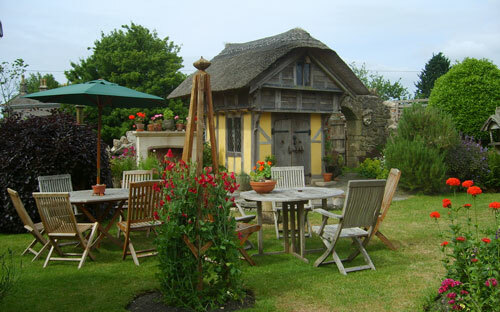 The cottage is spacious & comfortably furnished to provide a 'home from home'. The pretty garden is shared with the owners. Feel free to use it and relax in. A wonderful covered barbecue/fireplace and before it a 12ft garden table and benches just waiting for that warm summer evening or lazy afternoon. Two magical little playhouses called Ruth's cottage and Tom's Lodge await each child for a playtime never to be forgotten. A regular bus service across the green will take you to Wells or Bath. You will never be short of places to explore during your stay, within an hour’s drive you can reach The Cotswolds, The Mendips, Bath, Bristol, Wells, Cheddar, Wookey Hole & more.